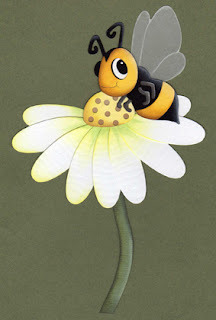 Last Chance to leave a comment about your favorite Spring Quickutz release die! Winner will be announced tomorrow so don't wait! 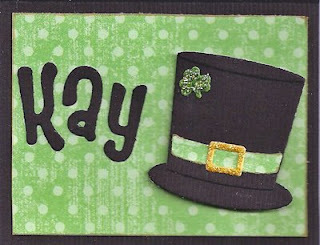 Chick-A-Dee 4x8 font and the hat from the Revolution St. Patrick's Day die, some distress ink and some Stickles. The new 12" Flower border from the Feb QK release is so versatile! To create this card, I simply cut off two of the five flowers from the border and placed them on an angle onto the card. You can use the flower outlines as I have done in this project or fill in the petals with contrasting cardstock for a completely different look. I love a die with so many options! The alpha I used is Quickutz Strawberry (which is on sale in the store right now!) and I outlined the letters with a brown pen to add a little extra detail. 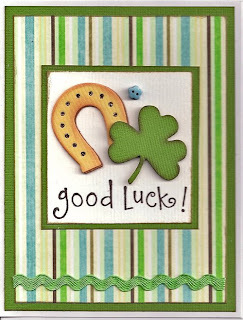 This Quickutz Revolution St. Patrick's Day die is also great for those times when you want to wish someone luck. Do you have a special friend or family member that's applying for an important job, position or college? These shapes work great for wishing them "Good Luck!" The horseshoe was cut out twice, one in yellow and one in brown. Then I chalked around the edges and added a bit of Stickles in each hole. For the shamrock I added a little distress ink around the edges and used some mounting tape to make it pop up just a bit. 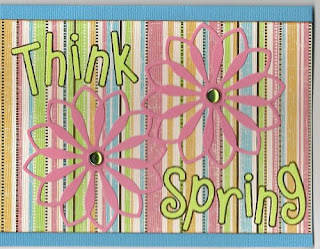 Here is another card using the latest dies from the Quickutz Spring Shapes release. This chocolate bunny die was a must for me. He's so cute! For this card I punched a tiny hole in the top of the ear and used a jump ring to keep the bunny hanging straight on the safety pin. Be sure to leave your comments and specifiy which shape is your favorite from this release to win the shape of your choice. You have until Saturday night to do leave your comments. 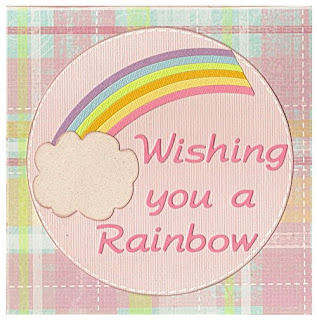 I created this card using the new doublekutz Quickutz Revolution Weather die that includes this fun rainbow! I thought the rainbow might be difficult to piece together but each band fits so easily! Don't forget to enter our contest and post your vote for your favorite die from the new February Quickutz release for your chance to win any die of your choice from this new release (excluding the alphabet). Just click here and you will be taken directly to the contest post and you can add your comment to be entered into the drawing. Remember you have until Saturday at midnight to cast your vote! 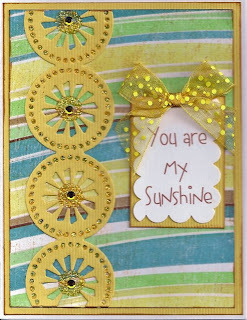 Here is a fun card using the Quickutz Sunburst border. I punched out the sun pieces and applied Hero Arts gems (coming soon to the store) in the center and then used Stickles. 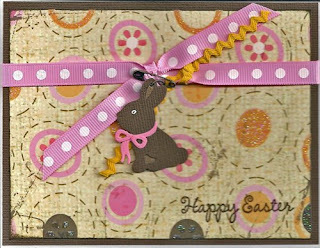 This border is great for cards or those summertime layouts. Quickutz or CottageCutz products you receive this Cracked Egg die for free. 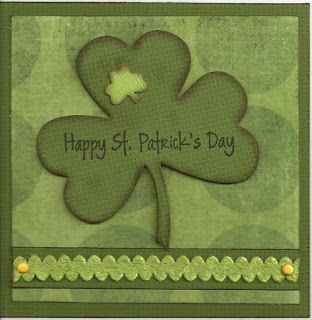 This new Shamrock Border is fabulous! One run through the Revolution and BAM you have seven shamrocks ready to go! They work great as one solid border or you can cut it apart to make smaller borders or even use them as individual shamrocks! The shamrocks are slightly different from each other which makes this border die that much more versatile. The possibilities are endless! Keep an eye on the blog for even more projects using this great new border die as well as many others from the new February Quickutz release! Don't you just love this new Spring Quickutz release? Now if we can only get the spring weather to come too! 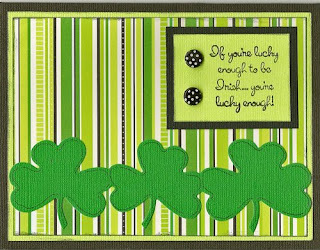 I used the new Revolution Shamrock die to make this card as well as the tiny shamrock from the Cookie Cutter spring set. I shaded the edges with my distress ink and a sponge dauber and stamped it with the Hero Arts Happy St. Patrick's Day stamp. 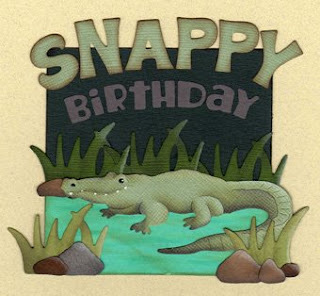 Be sure to check back often as we will be posting more cards using the dies from this new release. 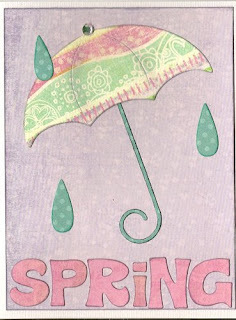 Spring is in the air here at Scrapping Cottage with the fabulous new February Quickutz release!! Be sure to check all these cute new shapes! And to add even more excitement, we have an exciting new contest starting here on the Cottage Blog. Just add a comment to this post telling us which is your favorite die from the new February Quickutz release. You have until Saturday at midnight to make a comment and then on Sunday we will draw a name from all the comments and the winner will receive a FREE DIE of your choice from this new release (excludes the new alphabet). Be sure to check back often to see everyone's favorite picks and to enjoy new projects each day all day long here on the Cottage Blog. Got candy? This card should have read "Got M&Ms" in my case. :) Fun card to make using the Sizzix Bigz Die, Owl With Hat found here at Scrapping Cottage. CottageCutz Penguin "That is so Cool!" Congratulations card. I also used the Quickutz 4x8 Banana Split alphabet that is on sale right now for 50% off! Be sure to check it out in the store. The snowflakes and the border are also Quickutz. I took the bead border die and punched holes in it to get this look. We have a fabulous 50% off sale going on right now on 4x8 Quickutz alphabets! They are going fast so you don't want to miss out! 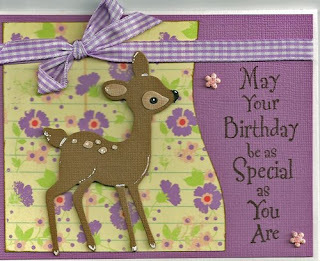 This card was created using Scenic Route Grafton papers and Quickutz Nesting Flowers and the 4x8 Rollerskate alphabet. 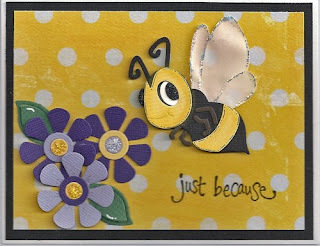 Here are some more cards using the CottageCutz Bee and Deer dies. These are so fun to detail with chalks, Stickles and pen detailing. 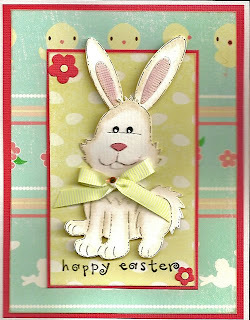 Easter is just around the corner and the CottageCutz bunny is perfect for those Easter cards and layouts. 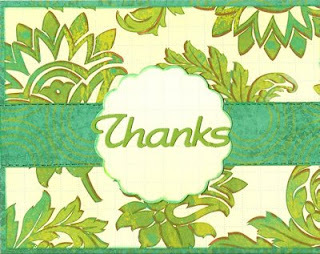 Check out our rubber stamp section of the store for lots of great sentiments. 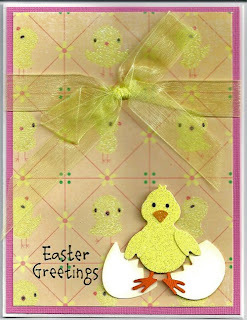 Here are two more cute cards made with CottageCutz dies from Jane A. Have you tried our CottageCutz dies? CottageCutz Dies are made exclusively for The Scrapping Cottage. We are proud to offer our own brand of shape dies. This die is approximately 4" x 4" and is compatible with the following machines: QuicKutz Revolution, Sizzix / Ellison Big Shot, BigKick, CuttleBug, SpellBinder Wizard and Accucut Zip'eMate. 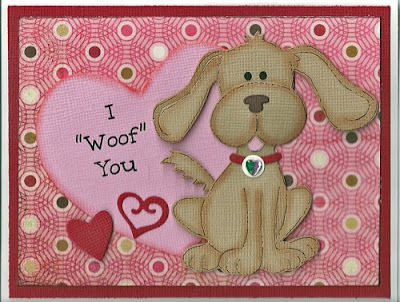 100% guarantee that this die cuts on the above machines. Adapters may be required on some machines. Made in the USA.